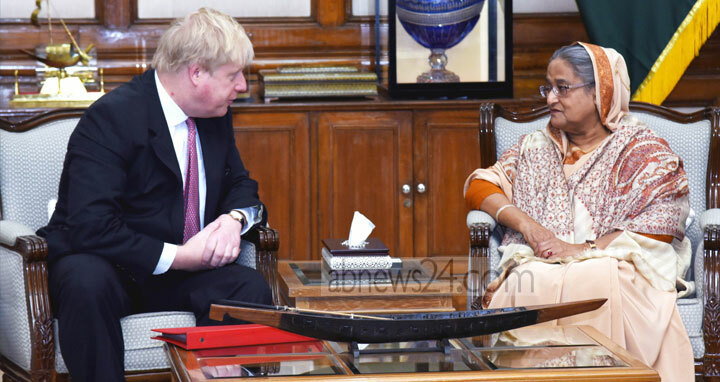 Dhaka, 10 Feb, Abnews: British Secretary of State of Foreign and Commonwealth Affairs Boris Jhonson called on Prime Minister Sheikh Hasina at her Gonobhaban residence here yesterday. Briefing reporters after the meeting, PM's press secretary Ihsanul Karim said they discussed various matters related to mutual interests particularly the Rohingya issue. Boris Jhonson emphasised on quick repatriation of Rohingyas saying delay in the repatriation may complicate the issue, the press secretary said. The prime minister agreed with the observation of Boris Jhonson saying Myanmar leader Aung San Suu Kyi should act for quick repatriation of the displaced Rohingyas. Myanmar authorities should also allow UNCHR and other international agencies to look into the rehabilitation process after their repatriation, the prime minister also said. Terming the Rohingyas stay here as a big burden on Bangladesh, she said Bangladesh has given temporary shelter to more than one million Myanmar nationals on humanitarian ground. They need to go back to their home as they are living here in a very inhuman condition, she said. Boris Jhonson compared the Rohingya crisis to one that happened in Palestine in 1948 when six hundred thousand people were displaced. He appreciated Sheikh Hasina's stand on safe and dignified repatriation of Rohingyas. Ihsanul Karim said the prime minister brought to the notice of the British foreign minister the attack on Bangladesh High Commission office in London on Wednesday last by an unruly group. Boris Jhonson assured the prime minister of looking into the matter, the press secretary said. Sheikh Hasina highlighted her government's stride to combat terrorism and militancy saying the government has launched a social campaign against terrorism as well as taking legal actions against the terrorists and militants.